Do you know someone who makes Hackney a better place to live? Tell the council by 2 April and you could see that person pick up a trophy in the Mayor’s Civic Awards later this year. The awards honour the special people in the borough whose commitment to improving their neighbours’ lives often goes unnoticed. It could be someone who has overcome extraordinary difficulty, a volunteer, carer or community leader. Every nomination will be considered by a panel of judges, and the winners will receive a trophy and certificate at a special Town Hall ceremony in May. 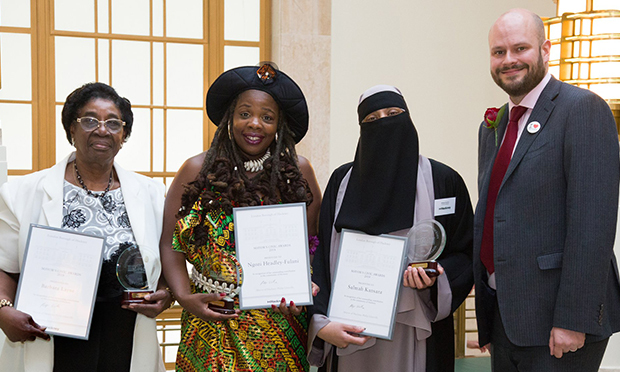 Last year’s winners were retired nurse Barbara Layne, charity worker Salmah Kansara and Ngozi Headley-Fulani, founder of domestic violence shelter Sistah Space. Mayor Philip Glanville said: “Thanks to the hard work of those who go the extra mile for their communities, Hackney is full of active citizens, campaigners and volunteers, who all essential parts of making it the welcoming and fantastic place it is today. “I’m pleased to announce we are opening the civic awards for the fourth year running, so we can carry on celebrating the unsung heroes of Hackney. Nominees for the civic awards can be of any age and from any background. However, if you are nominating someone who is under 18, please make sure you have a parent’s or guardian’s permission to do so. Please submit your nominations by filling in the online form. You can can also pick up an application form at Hackney Town Hall and libraries across the borough and post it to Tara Hudson, Hackney Town Hall, Mare Street, E8 1EA, or email it to tara.hudson@hackney.gov.uk. Nominations close on Tuesday 2 April.